as a contribution to the definition of innovative energy policies in Africa. The African continent is in a situation of political and economic transition, with some encouraging developments and some negative consequences. Overall, the economic conditions are greatly improved: Africa is growing at unprecedented levels and in 2012 its GDP grew at 6.6%, compared to 3.5% in 2011. This increase is partly due to the economic “reappearance” of Libya after its contraction in the aftermath of the 2011 civil war, but West Africa too led Africa’s growth, closely followed by Central Africa and East Africa. 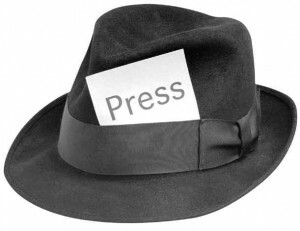 However, there are also some critical situations. Two years after the revolutions in Tunisia, Egypt and Libya, social tensions and political violence continue to threat political order and human security. Moreover, the two economic giants of the continent, Nigeria and South Africa, are facing difficult economic conditions. Furthermore, despite some encouraging progress in many African countries, instability and armed conflict in West Africa and the Sahel region remain an issue of major concern for the local population and the international community. As long as security is not restored, the economies of the region will remain vulnerable. Most problems and conflicts in Africa have regional origins and require regional solutions. The conflict in Mali is a case in point; it is centered in Mali but has its origins and consequences in the Sahel region. The Sahel, one of the poorest areas of the world, faces complex governance, humanitarian and development challenges. It is plagued by increasing presence of transnational criminal and terrorist organizations, which has resulted in the widespread flow of arms, drug trafficking and hostage taking. Regional conflicts and civil unrest, like in Sahel, damage the economy in five main ways: they destroy resources, they jeopardize social order and institutional capacity, they divert public expenditures from productive activities to military expenses, they reduce capital stocks and drain financial and human capital. 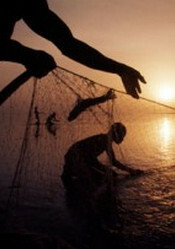 In order to tackle these different problems what I suggest to do is to employ an innovative approach based on two different but complementary pillars: the first is a sort of “bottom” level approach towards economic and political development, and the second is a “top” level approach towards international cooperation in Africa. Such an approach largely derives from my experience as UN Secretary-General’s Special Envoy for Sahel. Let us begin from the “bottom” level approach. First of all, we should fight against the deadly connection between poverty and insecurity in Africa. In doing so, however, we should not try to impose our models of development on African societies, but rather the starting point is to listen to the local people, to understand their priorities and to take account of their expectations. This will require, as we have already started to do in Sahel, an intense activity of consultation with the involvement of civil society, tribal and religious leaders, members of universities, women organizations, business, and local media. The first step is to empower experts, local universities and governmental institutions, to discuss and draft their own plans for development. Their leadership, in the starting phase, is essential to ensure the ownership on their solutions. The most important element of this bottom-up approach to development is to start with the involvement of the local populations in any economic project, especially the young generations. If we fail to improve the economic situation of the young African population, the likelihood of criminal and terrorist activities spreading all over Africa will be high. We could be confronted with situations similar to what happened in Mali. 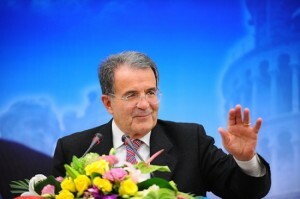 In regard to the “top-down” approach concerning international cooperation, I would like to begin by stressing that both as Prime Minister of Italy and, in particular, as President of the European Commission I have always believed in African integration and I financed the project of integration through the African Union. Politically, I ran many risks for this support, especially when I decided through the African Peace Facility to finance the regional missions of the African Union. I have always been close to the African Union because I am truly convinced that not only the development of Africa, but the dignity of African populations depends from the unity of the continent; a unity that can be organized in a variety of ways, probably around regional organizations that cooperate among each other. Cooperation within Africa, however, should be complemented by an international framework of cooperation among those actors with significant interests in the African continent: from international organizations like the European Union, the United Nations, the World Bank, to states like the US, China, and many others. The approach I am suggesting is significantly different from past and current practices, especially from those bilateral policies that most Western countries developed towards Africa in past decades. Unlike these countries,China has developed a continental foreign and economic policy with interests and investments all over Africa. China has been able to create a structure of relationship with Africa based on a variety of interests like energy and food security, and Beijing has heavily invested in sectors like mining, oil extraction, agriculture, public works, and manufacturing. Moreover, for the first time in history, China exports goods, capital, technology, and people. Although Chinese migration in Africa cannot continue for a long time, because of the critical demographic situation of China, it is likely to go on for another generation. Despite some critical conditions, there is no doubt that Chinese involvement in Africa has been beneficial for the African continent. Africa’s current economic growth, after a couple of “lost decades”, has certainly greatly profited by Chinese investments. As I mentioned before, China has been, also, able to develop a continental policy based on diplomatic relationship with most African states. In a way China has been the first country to understand that Africa will be the continent of the future: both in terms of population, economic growth, and security. But in Africa China is not only in search of resources and interests to develop. Beijing is also in search of soft power, because the Chinese leaders know very well that in international politics and economics hard power is not sufficient. China’s presence in Africa and its search for soft power is potentially beneficial for a radical change in the relationship of the entire world with Africa. Africa must be transformed from a region of competition between old and emerging powers into an area of cooperation for the benefit of the African continent and of the different African populations. We should try to foster further cooperation over infrastructure and water supplies, in the Nile and Niger regions especially, which is potentially a source of political tension due to climate change and a rising African population. If cooperation does not take place, sub-Saharan Africa and the Sahel region, especially, will remain the areas most vulnerable to economic disruption, civil conflict, political instability, and terrorism. The situation in Sahel is particularly troubling: here we have some of the poorest countries in the world experiencing a rapid population growth, with increasing numbers of internally displaced people and refugees, combined with porous borders that jeopardize the very notion and reality of statehood. Thus, transnational criminal activity and the presence of different terrorist organizations are not a coincidence, but rather the direct result of a variety of precarious conditions. In order to respond to these challenges every major state has the duty to help the United Nations in the stabilization of the Sahel region. The help might be political and diplomatic; it might be either in financial resources or in kind. But again, every major state should contribute to eradicate poverty and insecurity. We need also regional agreements among governments and non-state actors with the strong backing of the international community. We should try also not only to solve the conflicts when they explode, but we should also try to interpret the rising tensions when they emerge. Thus, competition must be avoided for the sake of Africa, but also for the interest of the international community. Only by combining these innovative bottom-up and top-down approaches, we might find the path out of misery and instability. Only through more international and intra-African cooperation, peace and prosperity can be attained and maintained. The complexity of such a project, which involves society and regional and international institutions, is a great challenge in itself. But only if we create a truly cooperation among African governments, civil society and international actors, we can guarantee to the populations of Africa, growth, peace and stability. Before leaving the floor to authorities and scholars, let me thank once gain our “old” partners in the organization of this Conference, the Woodrow Wilson Centre, the Johns Hopkins University, the African Union and the United Nations. 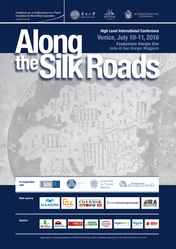 But a special mention, this time, goes to our Chinese hosts: the Ministry of Foreign Affairs of the People’s Republic of China, the Chinese Academy of Social Sciences, and the Institute of West Asian and African Studies, which have greatly contributed to the organization of this conference. I wish you a very productive conference! 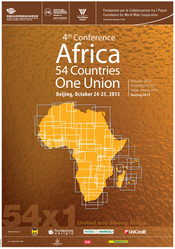 It is my great pleasure to open the fourth and final conference “Africa: 54 Countries, One Union” here in China. Being in Beijing for the final conference is not only a great honour for the present importance of China at the global level, but also because China is certainly to be the most important non-African country for the future of Africa. Since 2010 the Foundation for World Wide Cooperation, in collaboration with the Woodrow Wilson Center for International Scholars, the School of Advanced International Studies of the Johns Hopkins University, the African Union, and the United Nations, has organized three international conferences with the goal of promoting the political and economic cooperation among African states. For the organization of this fourth conference we have greatly benefitted from the sponsorship of the Ministry of Foreign Affairs of the People’s Republic of China, and the help of the Chinese Academy of Social Sciences and the Institute of West Asian and African Studies. In 2010 we started in Bologna, and then we had a “walk” around the world. We touched some of the most important places for Africa’s growth and cooperation: Addis Ababa, where the headquarter of the African Union is located. Then, Washington DC and now Beijing, the capitals of the United States and China: two states that are not only deeply involved in African economics, but which have also great political responsibilities towards the African continent and its growing populations. Therefore, the different locations of the conferences were not chosen coincidentally, but reflected a particular approach towards the development of Africa. One of the objectives of the conference series is to discuss, on the basis of the principle of African ownership, the adoption of a coordinated approach towards Africa by international actors such as the European Union, the United States, and China and international and regional institutions such as the African Union, the RECs, the African Development Bank, the United Nations, and the World Bank. The main goal of the conference in Beijing is to discuss concrete project proposals, especially for those African regions, like Sahel, that have not gained, yet, from the recent growth of the continent. The title of the conference – Africa 54 Countries: One Union – has never changed, because we still believe that cooperation and even integration among African countries is one of the main conditions for a broad development of the continent. First of all, “54 Countries, One Union” means a physical union based on a common and modern infrastructure, which is a crucial element for the future growth of Africa. A variety of recent studies have shown that that poor state of roads, rails and harbors can add from 30 to 40% to the cost of goods traded among African countries. Infrastructure is an element that interests all economic sectors and all African states, thus requiring particular attention and cooperation among countries. Without an efficient and common infrastructure the economic gaps of Africa will never been overcome. The lack of energy infrastructure is the most relevant barrier towards growth and higher living standards for African populations. Indeed, two-thirds of Africans do not have regular access to electricity: something that I can describe only as a shocking statistics that reflects a grim reality. In the area of energy, the use of new technology has a great potential, in particular for small scale solar energy projects at the community level. Solar energy can work effectively and quickly in areas where no grid is present because of a very low density of the population. 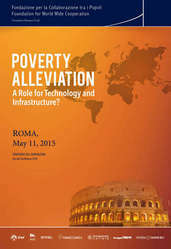 The use of the new technology might be critical in other areas such as water sanitation, mass vaccination of cattle with portable kits, information systems for market access of agricultural goods; distant medical control for first aid therapies by non-medical personnel, and distant learning for communities with no access to schools and teachers. Apart from the problem of infrastructure, the title of the Conference Africa: 54 Countries, One Union means also economic integration. In particular, it means a real common African market. Most African economies are still too small to work as efficient markets. If African countries want to become makers of their own destiny, they need to cooperate among each other and not to be afraid of opening their markets to other African economies. A single African market is a pre-condition for continental growth. It is, especially, a pre-condition for a real manufacture industry based on the best-technologies, because only with a big continental market, more and more foreign capitals can be attracted. Today, we know that some African countries are going towards a common market. But as it often happens, the results are likely to be limited and far from those expected and needed. In order to create economies of scale, the physical barriers and market distortions that obstruct the development of Africa should be gradually removed. Here market integration is a potential solution. I hope the issues discussed and the proposals presented at the conference, concerning both economic integration and common infrastructure, will contribute to both short and long term sustainable development. I’m confident that this conference will develop ideas towards concrete projects, especially in light of the new technology that, if employed extensively, can change the economic and social reality of Africa. Let me wish you a productive conference and let me thank our partners of the Woodrow Wilson Centre and the Johns Hopkins University. But this time, I would like to thank especially, for their hospitality and help in organizing this conference, our Chinese hosts, the Ministry of Foreign Affairs, the Chinese Academy of Social Sciences and the Institute of West Asian and African Studies. Reuben E. Brigety II, Deputy Assistant Secretary, Bureau of African Affairs, US State Dept. Participants: High representatives from AU, UN, US, EU, China, Brazil, Turkey, India, WWC Foundation, WW Center, SAIS-JHU, African regional organizations, WB, ADB, EBRD, EIB, WTO, UNIDO, etc. Opening Remarks by Romano Prodi at the “Africa: 54 Countries, One Union” conference. Honourable Prime Minister Meles, honourable Ministers, Ambassadors, authorities, dear friends, after the interest raised by the conferences in Bologna and Washington, it’s my great pleasure to open the third conference “Africa: 54 Countries, One Union”. Let me begin by pointing out that peace is still fragile in the African continent. The hopes raised by the Arab Spring have not been fulfilled yet. Instability is affecting Libya, and Egypt is still struggling for a new political order. Moreover, open conflict in Syria is a matter of great concern not only for the security of the Middle East, but for the stability of the entire Mediterranean region. Old conflicts, like in Somalia, are still ongoing and they seem unlikely to be resolved in the near future. New conflicts, such as between Sudan and South Sudan, are now threatening to open new spirals of violence and instability at the local and regional levels. Additional preoccupations emerge from the increasing number of religious tensions all over Africa, which are exploited by terrorist organizations and sectarian groups. Today, more than ever, there is a need for a strong African Union, capable of acting as an neutral intermediary among the conflicting parties. While the AU has achieved many successes, it is still in need of help due to a variety of limits, such as inadequate financial resources. Every state, every institution and every international organization should help the African Union in achieving its goals. Because of my experience as the President of the European Commission, I know very well the difficulties in creating integration and cooperative links among nations. The road toward integration is a long and difficult way, but this is only a more compelling reason to go towards this direction. By keeping in mind that the problems of peace and security in the African continent are far from having been overcome, I would like to focus on a different but related issue: the role of infrastructure for the economic, political and social development of Africa and her populations. Indeed I deeply believe that infrastructures are a precondition for fostering peace, development and the unity of Africa. The present economic fragmentation of the Africa continent is unfavorable to sustained development. The creation of greater markets is a key element for the economic growth of Africa. This point has been recognized and endorsed in the January 2011 African Union Summit, which has recommended the establishment of a Continental Free Trade Area in Africa. This is certainly good news because continental integration can strongly contribute to create more efficient markets, foster economic growth, and increase income and living conditions in Africa. This is exactly what happened in Europe since the 1950s. And I like to stress that at the beginning market integration produced fears in European populations and in their policymakers, but now no one raises criticism about the European common market. However, as European history teaches, in order to fully benefit from market integration, Africa needs regional and continental infrastructure, which is capable of transforming numerous isolated economies in a real Union. On this point, we should also keep in mind that the tremendous economic growth of China over the last two decades has been the result of huge investments in domestic infrastructure. In Africa a variety of important infrastructures have been created in recent times. For the sake of simplicity we might distinguish between infrastructures that need a centralized investment and those infrastructures that are created in a decentralized way without state and international intervention. Mobile telephony, which has had a huge penetration in Africa, is a typical example of decentralized infrastructure that has been created without the need of any state intervention. But not all decentralized infrastructures, can be left to the natural work of the market. Indeed there is a need of better financing instruments for other fundamental decentralized infrastructures like electric energy, water supplies, and credit services in rural areas. Over 60 percent of Africans are not connected to electricity. This situation can be significantly improved if we help people in rural areas to obtain solar panels that can produce electricity at local level. In other words, we must make an effort to spread this relative low-cost technology through incentives and better credit services. In relation, instead, to infrastructures that need centralized investments, we need to point out that Africa has still a low infrastructure ratio relative to other developing regions of the world. Two thirds of the region’s rural populations have no access to roads. Flight connections between African capitals are still difficult. Sometimes it is even easier to flight among those capitals from Europe. Despite great mobile telephony penetration, only 13 percent of Africans are connected to the internet. Africa needs to build regional infrastructure that will promote inclusive growth and integration, and will create large and competitive economic areas that are attractive to investors and might lead to increased employment and mobility of people across borders. When I speak of continental and regional infrastructure, however, I mean more than roads and sanitation. Africa is in great need of regional logistic networks connecting airports and railways to industrial and agricultural districts. African firms could achieve productivity gains approximately of 40 percent with adequate infrastructure. And GDP growth could be increased by 2 per cent per year. 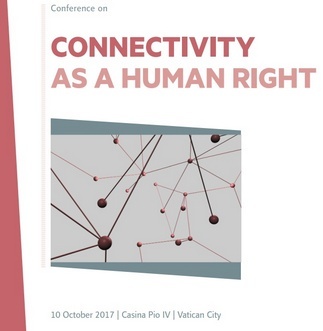 Regions that are well connected by transportation, information and communication technology will increase also social inclusion. There is strong evidence of the positive relationship between investment in infrastructure and growth in GDP per capita. Of particular importance are those infrastructure meant to manage the problem of water scarcity, which is a issue likely to increase in the near future. We should, especially, try to foster further cooperation over water supplies, such as the Nile region, which is potentially object of political tension due to climate change and a rising African population. Clearly, this needs huge investments because we cannot achieve this goal if we don’t heavily invest in new irrigation technologies. Although water wars have been a rare phenomenon in history, building regional infrastructures over water supplies can eliminate the risk of future conflicts. While infrastructure is critical for economic growth, financial support is critical for infrastructure. Let me quote some significant data on the present financial problems concerning African infrastructure. Around 93 billion of dollars are required annually to finance infrastructure in Africa, but current expenditure is only 45 billion dollars. With a potential efficiency saving estimated to 17 billion, we might assess the current financial gap being 31 billion dollars. Regardless of its economic and technical nature, the problem of financing regional infrastructure has also a political face. Developing the necessary infrastructure depends not only from financial resources but also by political will. Indeed the present financial gap can be further reduced through cooperation among African states, donors and developing agencies. Building regional and continental infrastructure, indeed, requires not only improved coordination among a number of African states and institutions, but also depends from cooperation among development agencies and a variety of international actors such as the United Nations, the European Union, the United States and China, and all countries with deep interests in the African continent. Today we are exactly here to help working together on this issue. Coordination is crucial if we want to avoid that donors and institutions focus on their own agendas, regardless of the real needs of African economic actors and populations. Hence, we need to create a more comprehensive and coordinated approach based on complementarities among states and development institutions. Only by doing so, we might find the path out of poverty and instability. Only through more international and African cooperation, peace and economic prosperity can be achieved. I’m confident that this conference will develop a message able to produce ideas for concrete proposals to be presented at the next and final conference in Beijing, which the Chinese government has kindly offered to organize. Let me, finally, wish you a productive conference and let me thank our partners of the Woodrow Wilson Centre and the Johns Hopkins University. I would like also to thank the African Union once again for hosting this opening ceremony today, UNECA for hosting us tomorrow, and the United Nations Office to the African Union for their great support. 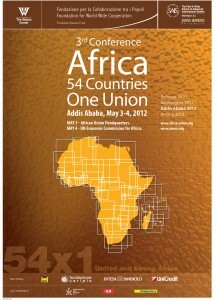 It will be held in Addis Ababa, May 3 to 4 2012, the Third International Conference of the cycle “Africa 54 countries, One Union”, sponsored by the Foundation for Worldwide Cooperation chaired by Professor Romano Prodi, in collaboration with the Woodrow Wilson Center and Johns Hopkins University of Washington. The Economic Commission for Africa of the United Nations and the African Union have also contributed to the organization of the Conference, which represents the third international meeting on the issues of African integration as a pre-condition for true peace and a fully sustainable development of the continent. The first conference was held in Bologna in 2010 and the second in Washington in 2011: both appointments were attended by African Heads of State, top representatives of the United Nations, African Union, European Union, international banks and other international organizations interested in the progress of the continent. Even this year are scheduled top level contributions on issues of peace, regional and continental infrastructure and market rules. Below are reported useful logistical information available to reach the event site and suggestions on the visa, your travel in Ethiopia, on transport and on the hotels available in town. I bus pubblici dell’ Anbessa City Bus Service Enterprise sono reperibili ovunque a cominciare dall’aereoporto. Sono disponibili inoltre i taxi della “Blue and white share taxis”, che dispone di diversi minivan per un massimo di 12 posti. Nel taxi oltre al conducente viaggia un “weyala”, una sorta di controllore che riscuote il pagamento e indica la direzione finale della corsa. Sono disponibili ovunque in città giorno e notte i “Lada Taxi” . E’raccomandato negoziare il prezzo della corsa prima di usufruire della stessa. Visa is issued at the Embassy of Ethiopia in your homecountry. You need two recent passport-size photos and a valid passport expiring over the next 6 months. The Embassy is issuing the visa (tourist visa) during the same day of the request submission.